The act of writing with pen and paper is a tactile way to identify both difficult and pleasing sensations in our mind, body, and spirit. 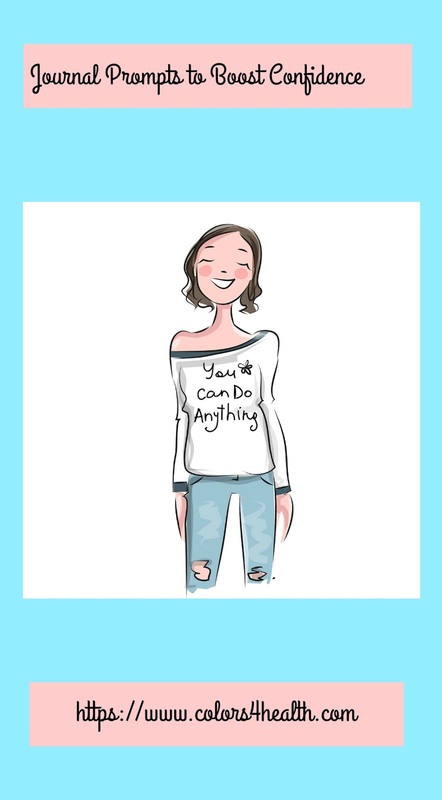 This post will show you ways your written words reveal your inner critic, and transforms those negative messages into incredible confidence building ones. 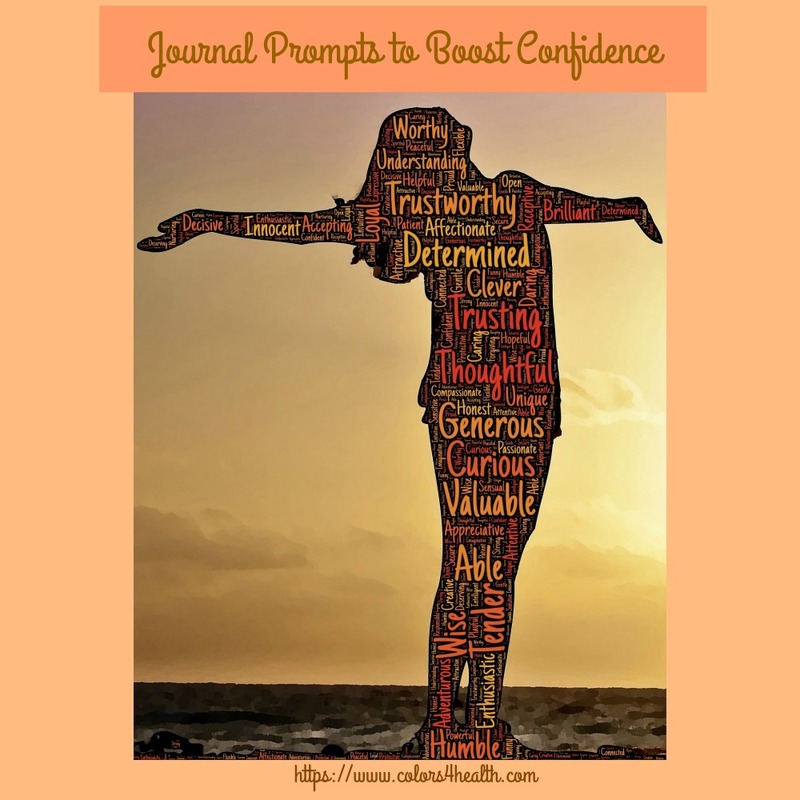 Journal writing shows us the level of trust we currently have in our abilities and accomplishments, qualities, perceptions, and actions. It shows us were we still need work. Grab a journal or notebook and make it a dedicated place where you can express thoughts, feelings, ideas, and dreams in a tangible way. Let it rip, uncensored as you share your frustrations, anger, hurt, or confusion, and the writing process will help you find healing and resolution. As you read through this blog post, jot down any ideas that resonate with you and pin or bookmark for future reference. Want to lighten and brighten the image you carry about yourself? Here's my list of confidence building journal prompts to get you going! 1. Speak to your heart as you write "I love and approve of myself just as I am." Journal about a "yes," "maybe," or "no" reaction to this affirmation. For today, accept your feelings just as they are. 2. In your journal, name one of your assets. Write down everything you think is positive, productive, and powerful about this trait. If you're in the habit of blaming yourself for past mistakes, judging yourself less than, or think you're unlovable, write about doing the best you can. 3. What did you do this week that surprised you? Was it something you wouldn't have attempted doing a year ago? Write about ways doing something new can help you grow. 4. Focus on validating yourself, rather than looking outside yourself for approval. Journal about ways to notice and record efforts you make to change and grow. 5. Do you doubt your judgment and second guess yourself often? Either way, write about "trust in yourself" now. Here are 4 affirmations to show you what trust in oneself sounds like. Say them aloud before you journal. Then write one or two affirmations of your own. 6. Have you made strides or accomplished something you are proud of this week? Write about progress not perfection now. 7. Self-confidence is tied to body image. Body image is tied to health and lifestyle. What steps have you taken to eat better, reduce stress, and exercise? What choices can you make today to clean up your eating or exercise plan? Write about that now. 8. When you maintain an upbeat attitude, it encourages you to feel more confident. Positive energy releases a flood of feel good chemicals into the brain that makes you look and feel like a stronger, more self-assured person. Write about the benefits of positive thinking today. 9. Studies show that the act of physically writing down what you're grateful for helps solidify it in your mind. I've found that a gratitude list makes me appreciate the blessings in my life, and is a good place to refer back to when I'm feeling low. It's a good bet it will work for you. Make a bullet list of things you're grateful for right now. Then pin this post for times when your confidence level is low and re-read. The only barrier to increased self-confidence is negative messages (lies) you tell yourself about you. 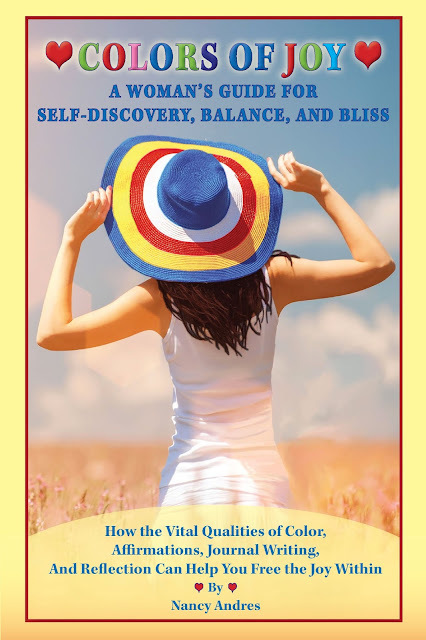 Why not pick up a copy of the self-care journal, Colors of Joy: A Woman's Guide for Self-Discovery, Balance, and Bliss? It's a 12 week journal program that features color-themed guided journal prompts to boost confidence and make joyful living a priority in your life. Before you go, please comment in the space provided below (If you put links in comments, I won't be able to publish it). Share which confidence building tools you already incorporate in your weekly routine or those you want to develop in the coming months. If you like what you see, sign up for the Colors 4 Health Wellness News for additional healthy lifestyle tips. You can play a key role in "greening" this holiday season. Green is associated with health, harmony, well-being, and the environment and a perfect color to signify eco-friendly actions. When you adopt and stick with the green ideas I share below, know that you will increase personal and world well-being all year long. Each tip is cost effective, saves time, energy, and makes the planet a healthier place to live. 1.If your holiday includes a Christmas tree, select a live potted one. Decorate your tree with popcorn and other edible decorations that have zero waste and will not eventually wind up in a landfill. After the holiday is over, plant the tree in the ground. Trees help us in many ways. They provide shade and insulation and therefore cut down both on heating and cooling costs. Trees replenish the air with oxygen, increases soil stability, and adds beauty to our landscapes. Trees are happy homes for birds and wildlife as well. 2. Shop for holiday goodies in markets or stores where they make an effort to be sustainable. Carry and use a reusable shopping bag. a. Natural Grocers sells only 100% organic produce and 100% non-gmo bulk (buying food in bulk is usually less expensive, cuts down on unnecessary packaging, and saves time and energy). b. They have eliminated plastic bags for checkouts. Since ditching disposable plastic grocery bags in 2009, they estimate that they've prevented more than 270 million plastic bags from being dumped in a landfill. c. Natural Grocers upcycles most of the cardboard used to ship products to their stores. Boxes are used for your order if you forget to bring your own shopping bag. Another example of a store that is being environmentally aware is the one in this a picture. If the market you shop at isn't taking steps to safeguard the environment, contact management to voice your opinion. If they don't listen, take action with your food shopping dollars. 3. Consume less, and recycle, upcycle, and hand-make gifts, toys, and decorations. When you do buy something new, make sure it's high quality. Thrift stores, rummage sales, and resale or repurpose outlets offer affordable gifts and packaging material supplies. In fact, see cost-saving, eco-friendly holiday present ideas, decor, and conservation ideas (shop online and cut back on fossil fuel use and time) below. a. Mary at the Boondocks Blog offers tips to repurpose old decor to make Bright Christmas Vignettes. 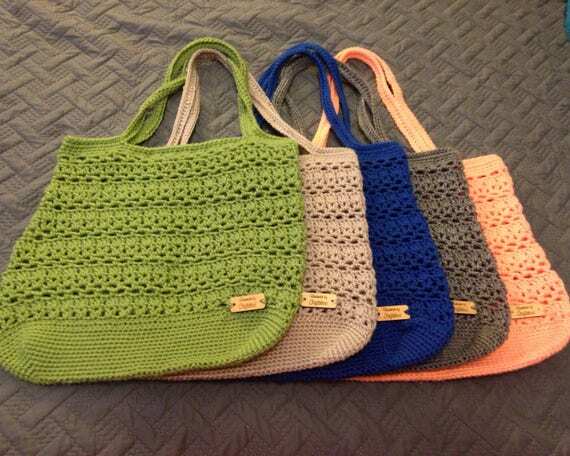 b. Amber Johnson at CraftABoo sells attractive, reusable multipurpose bags. Select one from various colors that are offered and cut down on your carbon footprint by using it over and over again. c. Katie Welles, the Wellness Mama suggests you give experiences rather than gifts. As she wrote, "Many studies show that material possessions do not equal happiness and that experiences are much more intrinsically fulfilling than things." d. Marla Gates at Organic 4 GreenLivings offers 15 Tips for Green Living— The Holidays All Year Long. e. Lea Stewart from inhabitant.com shows you how to make a beautiful upcycled fabric wreath. 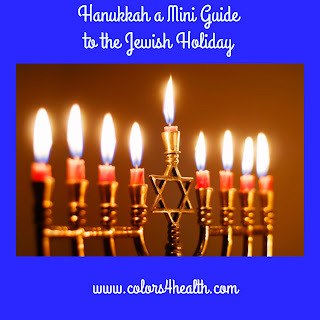 f. For a neat DIY gift for Hanukkah and tips about this holiday see Hanukkah, a mini guide. 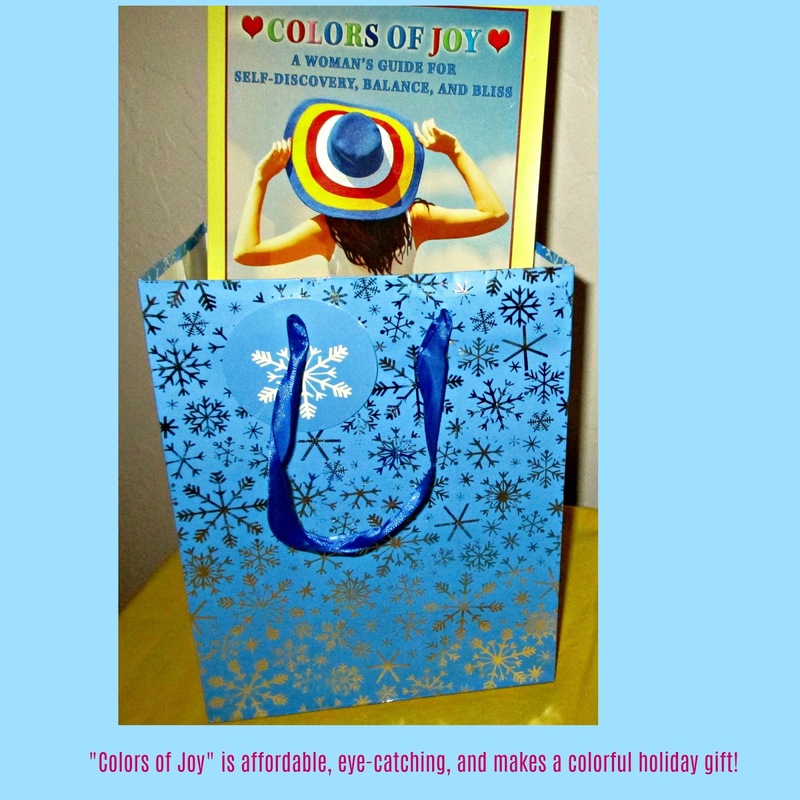 g. Take a peek at Colors of Joy: A Woman's Guide for Self-Discovery, Balance, and Bliss. 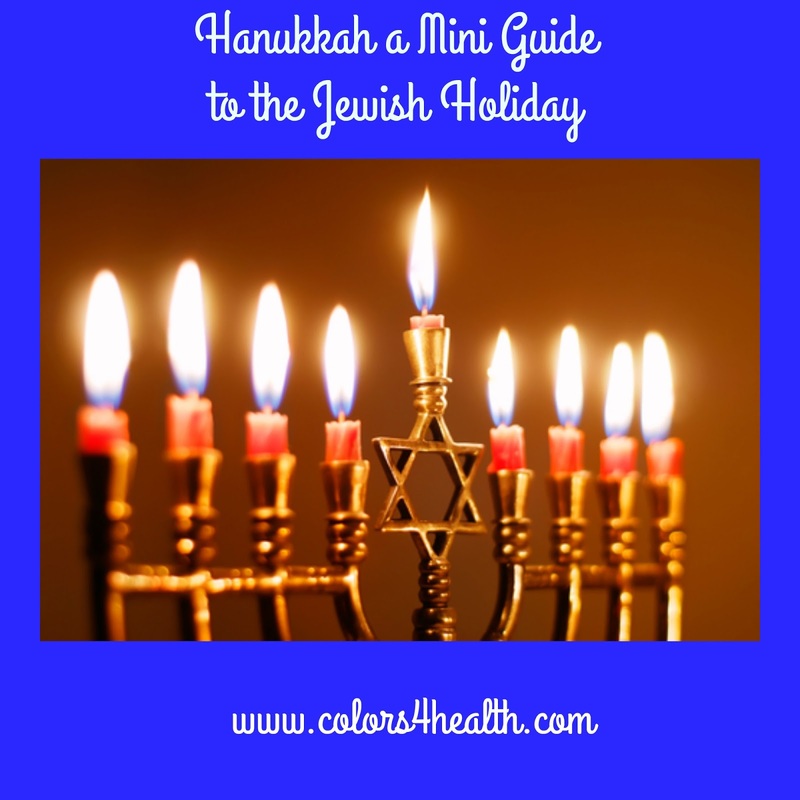 It's color-coded, and journal activities, affirmations, and self-care tips help you sail through the holidays with less stress and more happiness. Save time and cut down on fossil fuel consumption by shopping online for a thoughtful gift for friends, relatives, and your child's teacher. Order copies of Colors of Joy now for all the women you care about, including you. Each small eco-friendly move you take adds up. 🌲 Creating a greener lifestyle can do much to improve the quality of your life and the planet's health as well. Before you go, please sign up for the Colors 4 Health Wellness News. 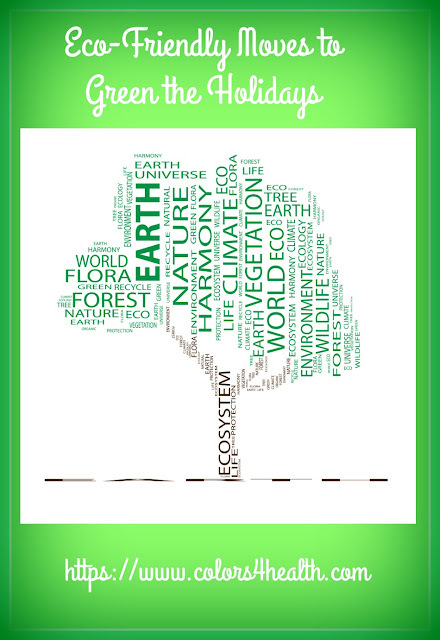 I'd love to hear from you about this post, or share ways you live a green lifestyle. Use the space provided (don't put links in your comment, as I won't be able to publish it that way). Perhaps you'll give my readers and me a new eco-tip or two. 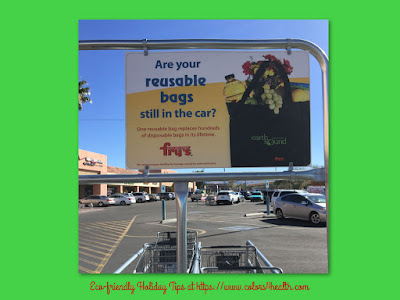 Has this post motivated you to add an eco-friendly move to your holiday and yearlong routine? Please share that info too.